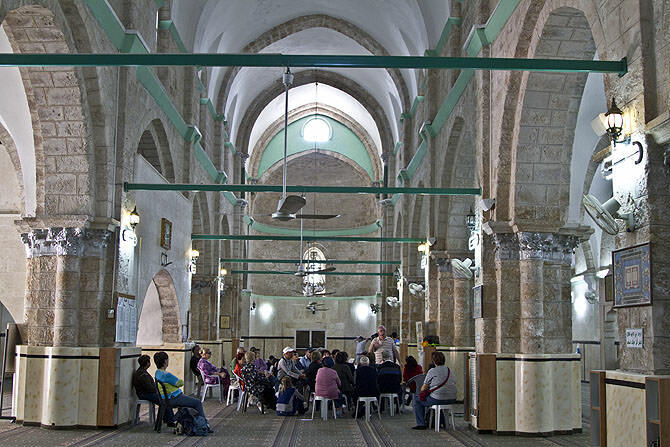 A tour of Ramla offers both a unique visual and culinary experience. In only a few hours, you can wander around by yourself on foot, to see extraordinary historic and archeological places, visit a vibrant market and magnificent houses of prayer, and meet lots of interesting people. Please note: There is a GPS application free of charge for smart phones which offers a guided, circular tour along all of the town’s sites, accompanied by recorded explanations. To download this application, search for “go ramla” in the App store or on Google, or scan the barcode in this leaflet and listen to the instructions. The best location to start your tour is the parking lot of the market or bazaar (parking is free), next to the Great Mosque and the Ramla Museum (number 1 on the map). A short visit to the museum - whose building served as the municipality in the course of the British mandatory period - will tell you the story of Ramla and the life of its citizens, from the time it was founded 1300 years ago until today. Next to the museum, on Herzl Street, is the Presidential Garden, named after Chaim Weizmann (2), which was originally planted by the British. 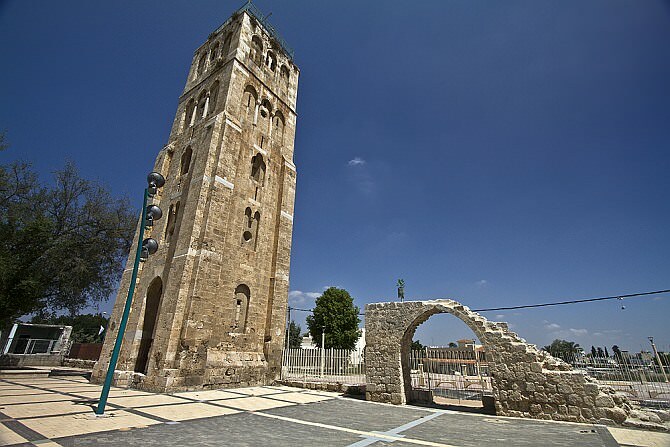 When you cross the park to the end, with Herzl Street at your back, you will see the Great Mosque of Ramla (3) in front of you, whose building once housed the big Crusader Church in the Land of Israel - a rare architectural pearl. When you leave the Presidential Garden, turn right, and after a few meters, you will find yourself at the center of the market (Jabotinski Street) (4) which is well known for its large variety of products, its good prices for fruit and vegetables as well as for its stands with food and drink. Turn left (towards the south) and continue for about 50 meters. Turn right into Emile Zola Street. After a few meters, the street bends a little, and directly to your right, you will find a red British mail box which in the past stood at the center of the British market. On the mail box, you will be able to see the Letters “G” and “R”: Georgius Rex – standing for the King of England at the time, the father of today’s queen of England. We now return north, to the place where we first entered the market. On Jabotinski Street, opposite the stand offering Turkish 'bourekas’, we will turn left into a narrow and short street. At its end, we will turn left again and immediately right, onto Shafiq Ades Street (6) which is lined with ancient houses, and continue until Detroit Community Street, where Ramla’s famous oriental restaurants are to be found. 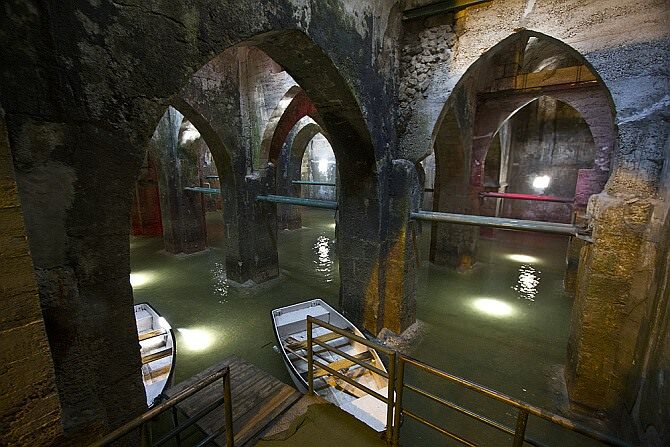 Until the middle of the 19th century, the 100 meters between the market and the restaurants were part of the main road between Jaffa and Jerusalem. From here, before we go on straight from the intersection to the street of the Franciscan Order. You now can turn left, onto the slope of Detroit Community Street, and immediately in the vicinity of the restaurants, it is worthwhile to try and enter the Greek Orthodox monastery of St. George (7) on the left. At a short distance behind the church, at the end of the street to the right, are the impressive remnants of the Radwan bathhouse (8). We go back to the intersection, turn left and continue on the street of the Franciscan Order. 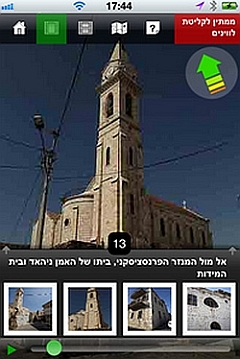 After a few dozen meters, you will discern the minaret of Ramla’s Lesser Mosque (9), and right behind it, you will see the tower of the Franciscan church (10). 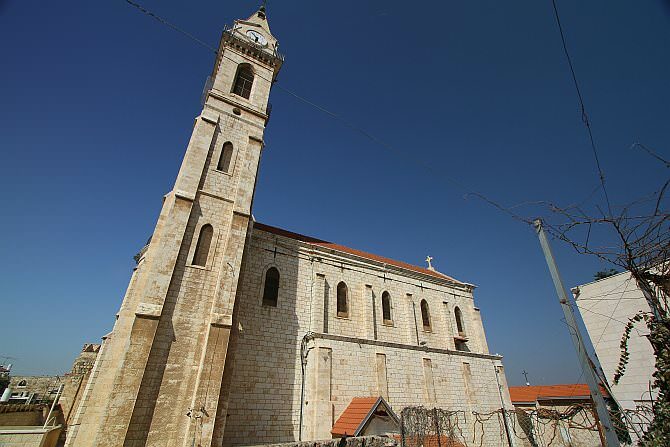 Move on straight ahead and find out whether you can enter the Franciscan church (the entrance is on Bialik Street), named after St. Nicodemus and Joseph of Arimathea, which houses a rare, 500 year-old painting by the Italian Renaissance artist Titian. From here, we continue west on a street that once again is called Shafiq Ades (corner of Bialik Street) to Dani Mass Street (a 10-minute walk) and to the square tower on the premises of the White Mosque (11). From the area of the tower, we go on north on Weizmann Street after passing the buildings of the court house and the municipality of Ramla, straight on towards the main traffic light. We then cross Herzl Street to reach HaHaganah Street and the Arched Pool (about 10 minutes on foot) (12). From here, we return to the parking lot.